We no longer present the company Egreat, which offers several multimedia boxes. A thread to talk about the new Egreat A11 which is the first of a new serie of device at Egreatworld company, there will be 2 other models that will follow in the coming months, the A12 and the A13. Thanks to Egreatworld for sending me a sample for review. The Egreat A5 and A10 media players are still in the catalog, the A11 does not replace the A10, despite their similarity, these are 2 different products. CPU – Hi3798CV200 Quad core ARM Cortex-A53 up to 2.0GHz, ARMv8-A architecture with multimedia accelerator engine Neon, build in hardware JAVA accelerator and hardware floating point coprocessor. Video Formats – MKV, ISO, MP4, AVI, MOV, MPG, MPEG, WMV, DAT etc. Audio Formats – APE, FLAC, WAV, AAC, WMA, MP3, AMR, MID, OGG etc. Picture Formats – JPG, JPEG, PNG, BMP etc. As for the A5 and A10, batteries are not included, for me it's a bad point the minimum is to include batteries in the box to have a device ready to be use, it is just my opinion. The box is heavier than the A10, finish is very good and the materials used are high-quality. The Egreat A11 has all the inputs and output which you need. There is a mistake on the manual. The right one should be 2.0a for main HDMI and 1.4a for audio only. The factory default is IR mode, if you need switch to bluetooth mode, please keep pressing the "Stop" key for 5 seconds, the indicator will be flashing with red light and then into blue light, which indicates it has entered into bluetooth mode. If you want to switch back to IR mode, just keep pressing the "Stop" key for 5 seconds again, the indicator will be flashing with blue light and then into red light, thus back to IR mode. 1.Boot up Egeat Player, confirm that bluetooth is on. 2. Under IR mode, keep pressing "Eject" key for 5 seconds, the indicator will be flashing with red light and then into blue light, after the blue light is off, the remote control has entered into bluetooth connection status. 3. At this moment, the bluetooth remote control will connect Egreat Player automatically, you can operate the player freely within the effective range after successfully connected . 1. Please switch the remote control to IR mode. 2. Boot up Egreat Player, turn on "Bluetooth" mode. 3. Keep pressing "Eject" key for 5 seconds, until the indicator entered slow flashing status with blue light, the remote control has entered into bluetooth pairing mode. 4. The player will search "AK86" device automatically,choose this player with the up/down key of the remote control, press "OK" key to connect. 5.After successfully connected, the player will show this dievice is connected, the remote control will automatically switch from IR mode to bluetooth mode, indicator will be off. - The PSU is earthed. This not trivial as detailed earlier by me. Looking at the physical size it probably indeed has been sized generously also. - The PSU is fully shielded which is the perfect thing to do. It avoids impact on audio/video signals both analog and digital. - The output of analog video and audio use discrete HQ components. Very relevant for people using specially analog audio out for discrete AMP's and headsets. For HDMI there is less impact. The extra weight comes from the PSU, we feel it when we hold the A11 in the hands, that's good news. 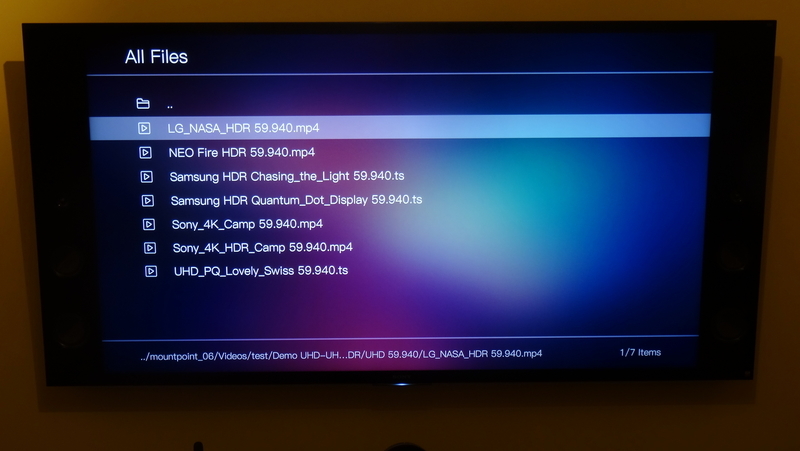 You have a mix of 1080p and UHD movies in your videos collection and do not want to change the settings every 5 minutes of your UHD HDR TV. With these parameters you will be able to see your films HD and UHD HDR without problems. 1080p60 / YCbCr 444 10 bits / HDR auto. The quality of the upscaling is different according to the brands of TV, so you can try both choice and see what settings you prefer. there is a problem with the 2160p60 YcBcR 4.2.0 10Bit, the Egreat does not keep in memory the 10bit, if you turn OFF and turn ON the Egreat, the setting becomes 2160p60 YcBcR 4.2.0 8Bit instead of 10Bit. For my tests, I use the box in dual HDMI, an original Egreat cable with the hdmi Audio only and a Monster cable with the HDMI Main. I also had the opportunity to do my tests using the HDMI Main with the original Egreat cable, and their cables allow you to enjoy UHD HDR content without any problem. Having already done audio and video tests with the A5 and A10, we will find the same results unsurprisingly, so I will do in the next days a small comparison between the Dual HDMI and the HDMI hand, we will see if there is a difference of PQ when using the dual hdmi on my 65 '' Sony. Nothing to report special, I tried different videos and everything works. Do not forget that the HDMI Audio only port is in 1.4, so you will be limited to the 7.1 system. The Bluray region bug seems to have been fixed. Please include also pictures of the interior. That is where the real differences should be. Here are the pictures, I'm not a pro. Thanks a lot! Nice detailed pictures. These confirm the higher quality build of A11. The cooling concept was not changed as far as I can see. I was not impressed with the cooling of the A10 as the casing did not absorb the heat of specifically the HDD very well, cooling mainly depended on the airflow. Only temperature measurements can reveal if this chassis does a better job? I live in Thailand but am from The Netherlands . Until now I use Kodi17.4 on my Windows 10 home pc. It works fine but I am missing a few things like ISO playback on bluray, 4K and menu-playback. So lately I am flirting with getting me an Android-based mediaplayer. I read many posts on both this forum as well as the brand- forums. As I live near Bangkok it is rather easy to get a player ...but which one should I buy ?. In all forums I see both your names coming up and both your reviews are, i.m.o., honest and informative. I realize that THE perfect player does not excist but that is not my question. I am thinking about buying one the players listed below. Zidoo X10. The Zidoo X10 is the one that I am thinking about. But here in Bangkok they are now dumping the Egreat A10 to clear stock for the coming A11 ....can buy A10 now for around 6.290 Baht/ 160 Euro. Compared with the Zidoo ( price in Euro here about 250,--) it would safe me about Euro 90,--. I like the looks of the Egreat A11 and of the Zidoo X10 but I especially regarding the Egreat A11 I am not willing to pay Euro 450,-- for nearly önly" better looks. It is the performance which counts. If the performance is really much better then ok...but if it is mainly "looks" then I pass. All have bugs but windows/kodi has that too so PERFECT does not excist. I realize that. My question to you both is.......considering the prize in combination with the performance which one would you buy ? What I want to ask Olivier......if I read your review about the Zidoo X10 you prefer that one over the A10.......considering the lower price would you still go for the Zidoo X10 ?. I know it will be me to make the final decision but I would appreciate your view. Thanks....I am no newbie to Kodi but to Android I am. I am using my A10 with my media centre setup and my X9S in my bedroom. I have a slight preference for my A10 mainly for the menu/command structure using the standard players. Regarding PQ and features they are very much on par with minor differences. Each has different shortcomings but as both products already came a long way one can definitely live with those. The Egreat A10 needs some tuning to get the best PQ as OlivierQC mentioned, overall we are very much inline with our mutual views. If price is a serious factor I would go for a bargain offer as both are excellent choices. The A11 is really for the guys who just want the best. If one spends many thousands on a 4K TV/Projector plus expensive audio equipment then I would go for the A11 for sure. Feature wise even an A5 offers the same as an A11. For KODI-only users the choice is between Vidon and ZDMC. Vidon has a problem as development seems to be frozen, ZDMC is probably the best choice? No idea what Egreat plans here? For pure KODI only I would personally buy another (cheaper) media player not being based on Android but Linux instead. I agree with Nice monkey. what I like about Egreat is stability with vidon, unlike zidoo / ZDMC sometimes I have an error message. Internal hardware is very similar between A5 and A11, the difference is the quality of some internal components (plug, cables, better shielding). Nice Monkey is correct that A11 will give better image quality, but the difference is very marginal. I don't think you'll be disappointed with the image quality of A5. can buy A10 now for around 6.290 Baht/ 160 Euro. I'd be very surprised if Egreat A10 is available anywhere at that price. It's way below cost price and Egreat A10 is not being discontinued. At first...thanks Olivier and Nice Monkey for both your advice. I I will go for the A10 then. And will get me an Egreat A5 for the bedroom too. Still cheaper then one A11. Sorry for Futeko.com but yes the Egreat players are cheaper here in Thailand. I just made a quick stroll around 4 shops in Bangkok (I could give ythe names but as you have a shop too I in no way want to undermine your business) and mentioned below are the prices I found Egreat A5 and A10 for here . Mind you it are not the Chinese models . One shopkeeper showed me a running Egreat A5 and it had all its software available in both Dutch and Danish. He told me mostly expats buy them. Thai customers preferred the plug and play players and reading here and on other forums as well that both Zidoo and Egreat are not. He also told me that Egreat is selling the A10 at a reduced price to get ridd off their stock. True or false I do not know but if i were Egreat I would do the same if I really wanted to push the A11. I also checked on internet and at the big shops I know in Chiang Mai and Udon Tani prices are near the same as ones you see below. The A11 is at the moment only available at a very very upmarket shop near the Emporium shopping center and for a price that made me fastly run away. Thai Baht 19.895,--...about 458 UK Pounds and they have to order it for you if you want one. Egreat A5 can be had here for between 4.290 Thai Baht and 4.990 Thai Baht...available all over the Bangkok. So between 95 and 115 pounds UK. Egreat A10 is only available at 2 of the shops I know in Bangkok and at the two big electronic shops in Chiang Mai between 6.290 Thai Baht and 8.990 Thai baht (but then with a free 500gb harddrive included). So in UK pounds between 145,-- and 205,--. Today I will go get me the Egreat A10 and start to "play"with it. Should I run into any troubles I know where to go: this forum. I just made a small test with the 2 output HDMI of the Egreat A11. With a pioneer Elite SC81 which does not support the DTS X, ATMOS and the HDR, with a Sony TV 4k 850D compatible HDR. With a Onkyo 656 which support the DTS X, ATMOS and the HDR, with a Sony TV 4k 930C compatible HDR. despite the fact that the receiver is DTS HD compatible. All current audio standards including ATMOS and DTS-X should work via HDMI 1.4 as far as I know. It works in combination with HD video and some UHD modes only because of HDMI 1.4a bandwidth restrictions. As UHD Video is stripped with the splitting over 2 ports it should work then with any Video mode on the other port. Obviously the AMP needs to support all advanced HD Audio modes too. ATMOS and DTS-X typically come with HDMI 2.0a capable receivers only. Some older receivers will be capable to strip the HD DD/DTS signal and still play the so called core as standard DD or DTS. My Onkyo older TX-NR609 receiver does so for ATMOS and DTS-X. Other HD audio modes are supported by it natively. Should work like that also using dual ports. Q: PSU type? Egreat A11 has an IEC C14 power socket. We ship an IEC C13 power lead suitable for the country the order is being shipped to. Europe - 2-pin Europlug, UK - fused 3-pin UK, USA/Canada - 2-pin US, Australia/New Zealand - 2-pin Australian. If you have a request for a specific power lead type please email us. Sorry Futeko but you should be shipping 3-pin power cords for all countries not just UK to make the box Earthed as it is designed for. I am aware that this requires multiple types of cords for various countries within Europe. Obviously a 2-pin cord just works but the better design advantage is lost. The socket on the box is the most common standard for professional equipment and finding an obsolete matching power cord should be very easy. This for those wanting to swap it for a quality cable. Desktop PC power cables are good examples.